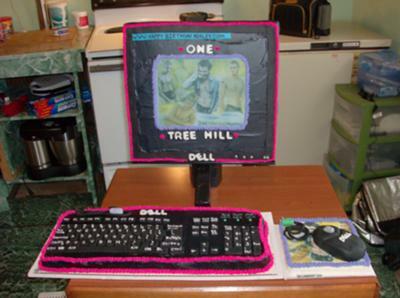 This computer cake was for my niece's 20th birthday. The monitor is pound cake edged with fondant. It's held up by a wooden base I made. The keyboard is yellow cake. I cut all the keys out of fondant, free handed the lettering, and the mouse is pound cake and so is the mouse pad. The picture is my nieces favorite actor on one tree hill. It's printable icing I had done at a bakery. That is awesome!!!!!!!!!!!!! Great job!!! !